It was lunchtime and I was feeding my baby when my hubby asked me to put his food in the microwave and heat it up for few minutes. He asked me because I sat next to it and it was easier for him if I do it. So, I faced the microwave and put the right settings. When I looked back at my baby, he had already grabbed his spoon and fed himself. I was caught in surprise because I didn't expect him to look like this. He likes to grab stuffs especially during feeding time. But I usually catch him on time before he spills or drop it. My hubby and I were laughing at what happened. I grabbed my camera and snap a photo of it. Isn't he so cute? Good job to your baby. That's really a milestone. Hanaha so cute. I miss those messy but cute days! ahahaha...someone is trying to feed himself, now it's all mess up...kids are just wonderful. 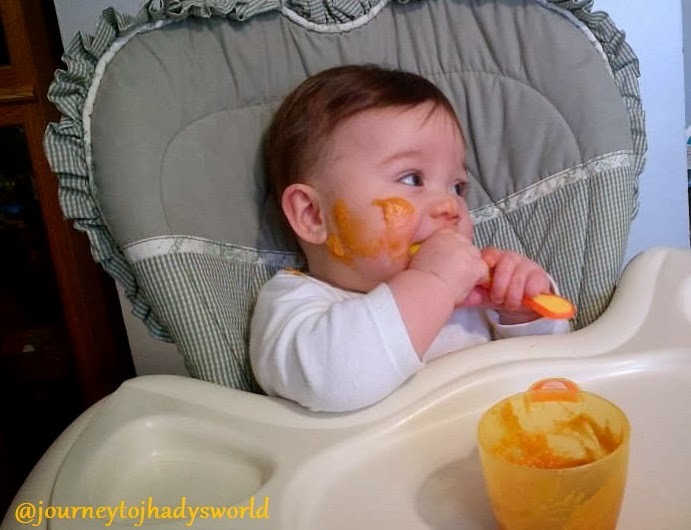 Some parents like it when their babies makes mess but I was on the opposite so I was always on the lookout..
Hi Sis, Just wanted to answer your comment Q from my blog. Yep, the swans are awesome and yep those are my 2 boys :) Nice to know that you have 2 boys too :D Your youngest is so cute! Makes me miss having a baby!